We offer our customers a wide variety of towels, but sometimes simple is best. Our premium white hand towels made from 100 percent cotton are perfectly suited for any surroundings. Whether your business hosts a bright, vibrant color scheme or projects a monochromatic color, our white hand towels adjust accordingly. Not only do our towels emit excellence, but they perform it. With extra-absorbent qualities and a soft, gentle feel, our premium white hand towels do more than just look nice. Woven from 100% cotton fibers, your guests and employees will enjoy the indulgent properties of pure fabric material. Salons: Use our premium white hand towels after your customers receive a manicure or pedicure. The smooth feel of cotton ensures your clients will never experience abrasive drying while at your salon. Their ability to be bleached also makes them the perfect accessory for cleaning up hair dye, nail polish and other messes. Bars and Pubs: Our premium white hand towels also serve excellently as bar towels designed to meet your clean-up needs. Their simple design ensures they’ll be in perfect harmony draped along your countertops and tables. Because our towels are durable and quick-drying, they’re also ideal for mopping up spills quickly and efficiently. 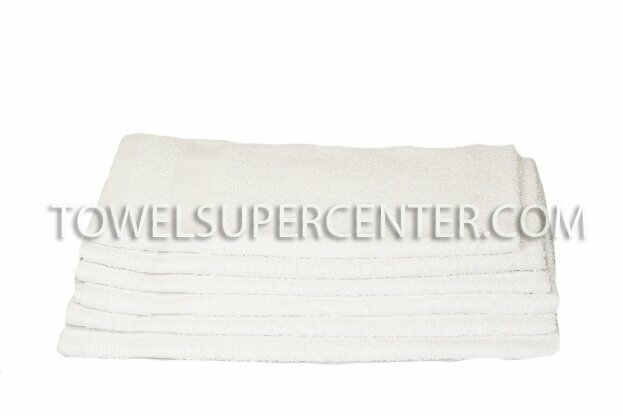 Gyms: White hand towels are an essential component of every gym and recreation center. Offer our handle towels conveniently folded in locker rooms to provide your members with an easy post-workout clean-up. Our towels also perform excellently while mopping up excess sweat left behind on machinery and equipment. Hotels: With a smooth, indulgent cottony-feel, our premium white hand towels offer your guests the comfort they desire during their stay at your hotel or inn. Towels are a necessity in every room, so why not provide your guests with optimal quality? Home: While not a business, your home also deserves the same level of quality provided by your business. Our premium white hands towels are conveniently crafted with the ideal properties that make them versatile enough for wiping down your counters, sprucing up the interior of your car and drying your hands after washing the dishes. Whether you’re lining the shelves of your home or business with our premium white hand towels, Towel Super Center offers you the products you need at prices you can afford. Why not stock up on towels when the prices are this good? You’ll pay only one shipping fee while ensuring you have enough quality towels for the future. Place your order with Towel Super Center — your one-stop-shop designated to meet and exceed your expectations.